Here is a shot I took recently at Harpers Ferry. 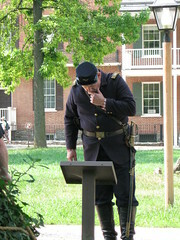 There were some reenactors from out-of-state, so I guess it explains why this guy was reading the sign explaining what happened at that spot. But it makes for a funny out-of-character moment.